For your sweet ballerina who loves tea parties!! Perfect for an afternoon tea party with dolls & friends or at a real tea party birthday! Actually holds liquids for sipping tea or punch! Handpainted using food-safe, dishwasher safe paints and glazes and fired in my kiln. 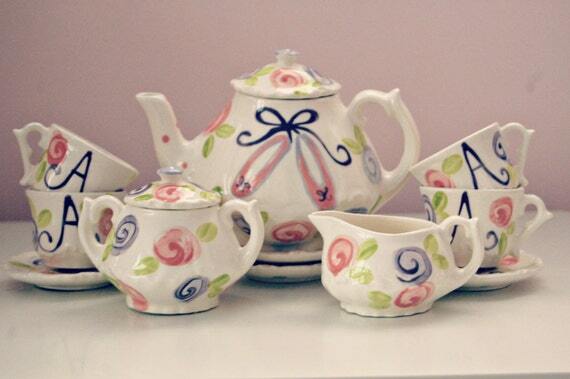 Since the tea cups & teapots are custom painted just for you, I will be happy to change the colors and design to suit your taste -- I love it when you send me an 'inspiration' piece so I can coordinate the tea cups perfectly. Convo and we can work together on an order. Please allow 3-4 weeks for shipment - as with all my items since they are custom painted just for you!